This page is to promote businesses local to St Erth and not for advertising multi-national or international conglomerates! If you wish to be included please complete the form below - there is no charge. To find out more about each of the businesses please click on the relevant link. Looking for accommodation? The Star Inn has 2 warm rooms with a rustic vibe feature wood-beamed ceilings. Both have flat-screen TVs, en suite bathrooms, and tea and coffee making facilities (1 room can only be accessed via steps). We welcome and cater for all. We are dog and welly friendly so bring the whole family. Phone for details 01736 752068 or find us on Facebook.com/thestarsterth, Instagram@thestarsterth or email: thestartsterth@outlook.com. Geoff Bickley Woodcarver specializing in birds since 1993. Every piece of wood is different therefore every carving has its own unique charm. Lesley Bickley Artist - Using the medium of oils as a first choice. Also adds the colour to Geoff Bickley's bird carvings. Gilly Hooper It's All In The Frame Bespoke Picture Framing Protecting your valued paintings and preserving your memories, photographs, fabric and Textile, Canvas, Needlework, Cross-stitch, Sportswear, Memorabilia, Conseratin etc. Experienced picture framer offering a quality framing service to your personal choice and requirements. Pick-up and drop off service (Home Visits). To find outmore visit our website, phone 07502 392 839 or email gilly@itsallintheframe.co.uk. St Erth Webmaster for an affordable site tailored to your needs. Clubs, organisations and charities a speciality. Doggy Day Care Cornwall, situated on Chenhalls Road, St Erth, offers a home away from home where your pet can play, learn and socialise. Dogs need both physical and mental stimulation and so our daily activities test your pet's inquisitive nature and excite their senses to leave them tired, happy and fulfilled by the end of their session. For longer stays, our luxury dog boarding service is ideal if you're away overnight or off on holiday. Experienced with all breeds, we are fully trained in pet first aid. Aggressive or antisocial dogs are strictly prohibited. For more information call Jordan on 01736 317123, visit our website here or email us at info@doggydaycarecornwall.co.uk. 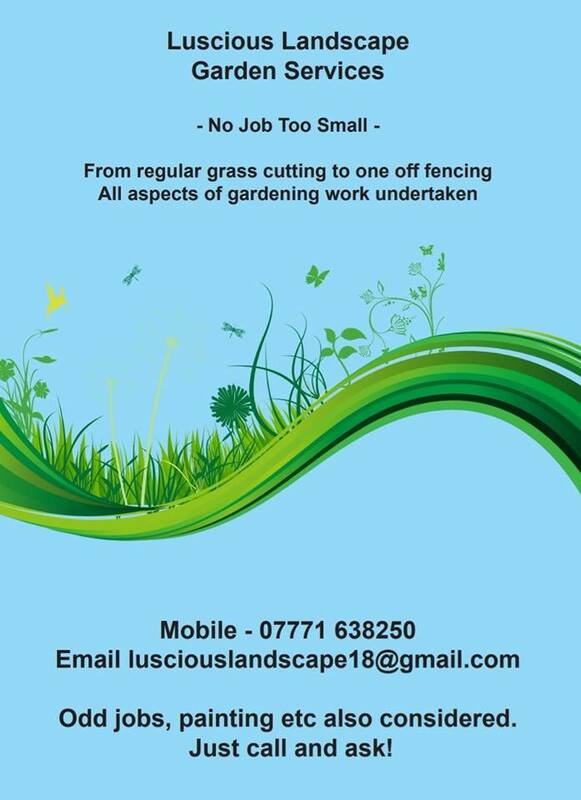 Luscious Landscape Garden Services If you need your grass cutting, hedges trimming beds weeding just give me a call on 07771 638250, email lusciouslandscape18@gmail.com or a message facebook.com/lusciouslandscape18. No job too small, from regular grass cutting to one off fencing, all aspects of gardening work undertaken PLUS odd jobs, painting etc also considered. Just call and ask. St Erth & Hayle Cars Taxi/Private Hire - Local based company which can accomodate the needs of everyone. We have a range of vehicles and can do short trips to the shops, nights out, airport and train station transfers and much more. We have 4, 7, and two 8 seater party busses. We also have a wheelchair accessible vehicle. You can either Call us on 01736 754040 or 07706040400 , or email us at info@sterthandhaylecars.co.uk or Book in advance online here and pay with PayPal!